Minnesota Vikings running back Adrian Peterson has been reinstated and will play this Sunday against the New Orleans Saints. He had been deactivated this past Sunday after being charged with child abuse. 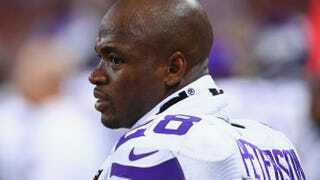 According to Yahoo News, Vikings owners Zygi and Mark Wilf announced Monday that Peterson will be back with the team. Peterson was charged with hitting his 4-year-old son with a switch, causing several lashes. Peterson was not allowed to play this past Sunday in what was a 30-7 loss to the New England Patriots. It was reported by several news outlets that the Vikings were considering all of their options, including trading Peterson to another team. Yahoo News notes that the Vikings claim to take the issue seriously and " … want the legal process to take its course before making any final decisions." Peterson's lawyer told Yahoo News that he was not trying to harm his child but merely sought to discipline him.